What Should We Know about Human-Induced Earthquakes? 18 April 2017-DENVER — The 2017 SSA Annual Meeting opened with a public town hall on human-induced earthquakes, with a panel of experts on hand who presented an overview of induced seismicity science and the regulatory steps in place to minimize the damaging impacts of induced quakes. 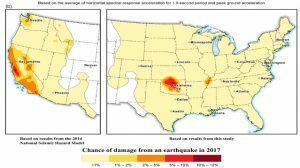 SRL: 2017 Model Predicts Significant Chance of Earthquake Damage in the Central and Eastern U.S.
28 February 2017–Results of a massive new project to map and classify the earthquake shaking potential across most of the Las Vegas metropolitan area will help developers there build in safer and less expensive ways. The “Parcel Map” described 28 February in the Bulletin of the Seismological Society of America is the most extensive effort to date in the United States to map and classify soils based on their effects on earthquake shaking across an entire urban area with systematic, direct measurements at high density. 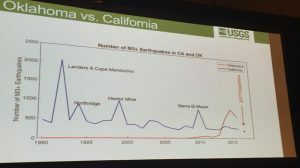 1 February 2017–The remarkable reach of the U.S. Geological Survey’s “Did You Feel It?” website can be used to improve maps of earthquake intensity–if non-reporting areas are including in the mapping analysis, according to a new study published online February 1 in the journal Seismological Research Letters.